I made paella once before and a Latina colleague informed me that unless it contains meat, paella is merely veggie rice. I don’t think she’d be able to argue with this vegan paella, though. We used Vigo yellow rice instead of making our own. Brent and I have become big fans of this vegan rice mix because it’s tasty, easy and costs less than $2. If you get to try it, it gets a little toasty on the bottom of the pan and don’t worry because this improves the flavor significantly. I started by sauteeing some onion with a little olive oil and some flake red pepper. 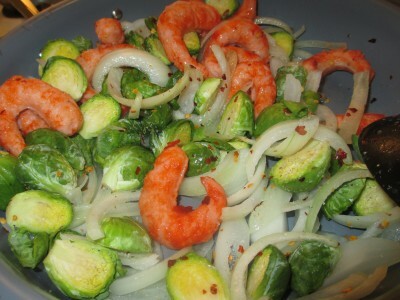 While that was cooking, Brent was cutting some Brussel’s sprouts and thaw the Ocean’s Best vegan shrimp.We also threw in some black olives that I cut in half. These all went into the pan until everything was steamy and hot and the onion was soft and the sprouts had begun to soften. I turned off the heat and added the red pepper. I put a lid over it and allowed it to steam until the pepper was just barely hot. 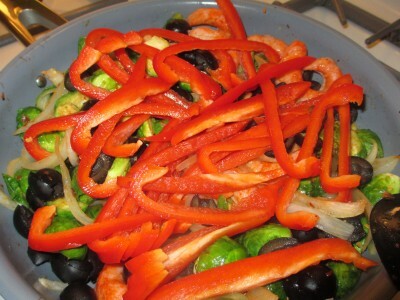 I find bell peppers get bitter when cooked so I avoid cooking them completely unless the skin has been removed. We scooped some rice onto our plates and arranged the veggies to make the paella look delicious and that didn’t take much effort. It was really good and the shrimp definitely added what was missing from my last paella effort. Next time I might add daikon as an answer to sea scallops. 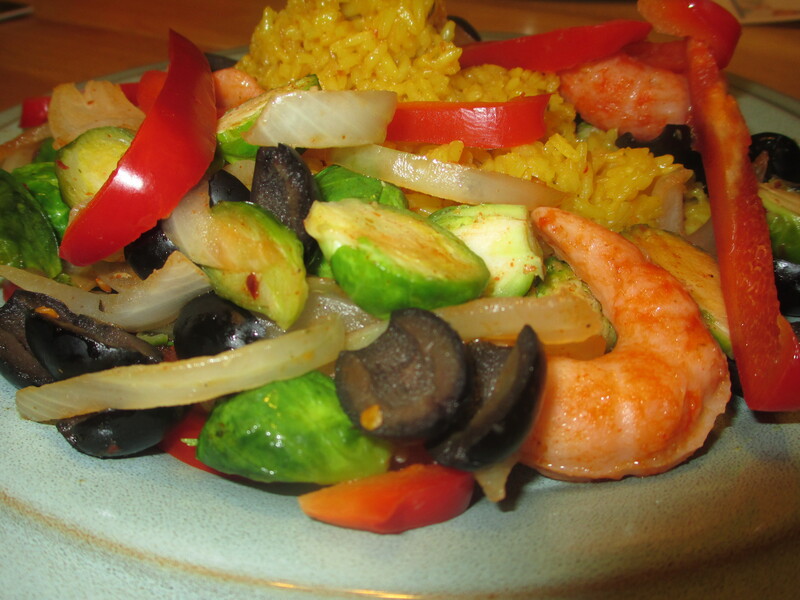 Savory olives (instead of mussels), sweet bell pepper, herbal Brussel’s sprouts all brought out the light flavors in the saffron rice and sweet shrimp. YUM! Vigo’s rice has dehydrated chicken listed in the ingredients. I just looked and I have 2 bags with chicken and 2 bags without. I wonder if they changed their recipe and I didn’t notice? 😦 Thanks for pointing it out.